Research plays a strategic role in the Australian Government’s mission to promote gender equality in the region through Pacific Women. This Research Strategy covers a five-year period from June 2017–June 2022. 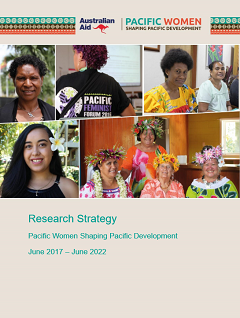 It has been developed in a systematic and consultative way, informed by ongoing research at regional and country levels and the scoping study on gender research in the Pacific, and is guided by a newly formed Advisory Group on Research (AGR). Members of the AGR include Pacific Women implementing partners and research practitioners with strong experience and knowledge of research on gender inequality in the Pacific. They also have an interest to increase capacity, quality, accessibility and policy relevance of Pacific gender research. For more information about the AGR, refer to Section 5 and Annex 2. Illustrative of a commitment to knowledge and learning, this strategy is underpinned by several documents and processes that DFAT has invested in to inform program direction. The key findings in these documents assist in identifying priority areas where research is required, with an emphasis on emerging areas of need.